When I came to create the projects for 6 x 6 Week I knew that there was a particular project that I wanted to make, but in a new size. I first came up with this shape during the Pootles Advent Countdown last year for Christmas and made 2 sizes in extreme opposites of huge and tiny, so it sort of made sense (well in my little head!) that I should make a middly kinda a size! This is a great size if you’re like me and treat your children to little goodies and bits. Heck, you could even put some healthy foodie snacks inside and they’d think you were the best Mum/Nanna/Grandma/Aunt/Uncle ever!!! I do mention my boys in the video, they are super stars and a massive help to me in most things. They empty the dishwasher, run washing around the house, and those of you who receive post from me, they are a big help in my business too! So a sort of nod to them, a nod to Christmas, and just a cute project all around! The ones you made for the Advent Countdown last year made for excellent tree ornaments. I was very happy that I had very little tree clean-up to do after Christmas because most of the tree ornaments we put up were made from your hang-able Advent Countdown posts! I love to watch all your videos, so good, how do you come up with all the different shapes and sizes? Where do you get your inspiration from? Love the 6″ x 6″ projects. 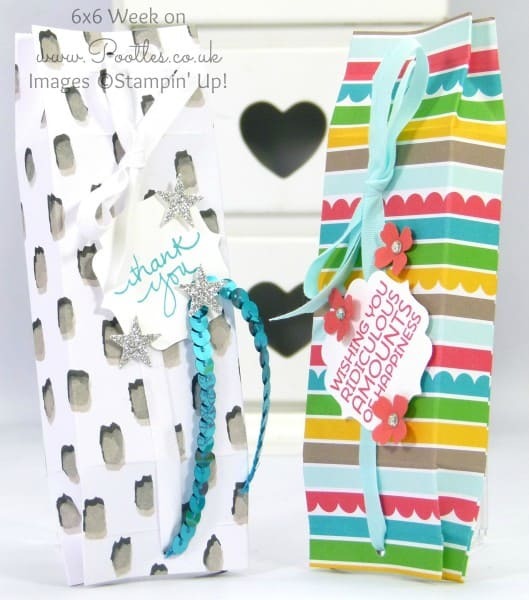 They are great for favors for my stampin ladies. This time around they’re going to make their own favors and fill them with something yummy! Yay!!! I really like how you decorated these!